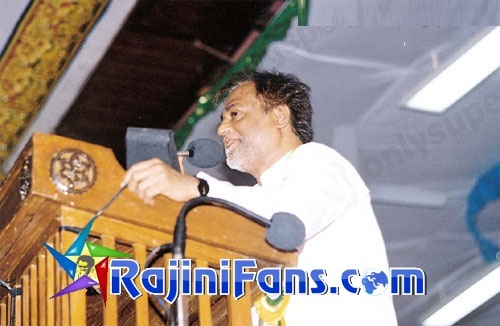 Rajinikanth spoke on "Who should govern?" during the award distribution function held in Chennai for the best actor, actress. "It’s been a year since I spoke in a public function. I am speaking today after a gap of 1 year. Padayappa has bagged 5 of the Tamil Nadu government's awards. Bagging the 5 awards including Best Actor and Best film gives me immense pleasure. I replied to them saying, 'Characterisation is good. Isn't it? Go ahead. Never should you weaken your enemy in an unjust manner. Neither should you look down upon them as weak. You should always be alert and sharp. We should grow stronger. Once we do these, the enemy will automatically become weaker. He will lose. So, don't worry about these things. Go ahead as we had planned and scripted. Don't change anything. If Neelambari dominates, I will look after it.' This film was thus shot with this kind of a challenge to me. 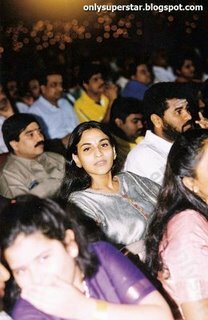 When Ramya Krishnan stood before me as Neelambari, I felt that Kamal Haasan himself, with Avvai Shanmugi makeup, is standing before me as Neelambari. So, to act in every frame I had put-in lot of efforts. Who won this contest? Is it me or Neelambari or director? - has to be decided by the people. I have won in their hearts. Today I have to congratulate Kalaignar because this is his own function. Many things happened during Dr. Rajkumar's abduction. Some people announced that we should not send ‘Mission’; we should not send an emissary. Because, they felt that these would fail. Few among the press - just a few - were suggesting spoiling this plan somehow. 'Aavadum pennaale, azhivadum pennaale' - meaning woman can be the source of either creation or destruction. There’s also a variation in that 'Aavadum pen-naale, azhivadum pen-naale'. I didn’t say this. Swamy Sachidananda, who being born in Tamil Nadu has been preaching about divinity for 38 years in America, has said this. During the period of Dr. Rajkumar's abduction, nobody knows better than me, the effort and pains taken by Kalaignar. He was very much focussed and passionate for Dr. Rajkumar's release, for the safety of 40 lakh Tamils living in Karnataka. At the same time, Kalaignar could understand the sufferings of an artiste - who has toiled to establish himself for the past 40-50 years and now at his age of 72-73 years has to suffer in the forest as a captive. I am duty-bound to thank Kalaignar for his efforts to obtain the release of Dr. Rajkumar. Next, my fans are very anxious about when I would start my next film and when it would release. Me too am anxious about it. On this auspicious day I convey my Pongal wishes to all of you. I pray to God to grant a good fate to Tamil film industry and to the state of Tamil Nadu." Vairamuthu's speech in the same function: "Here, for more than 35 minutes, Chief Minister Kalaignar was standing and distributing the awards. 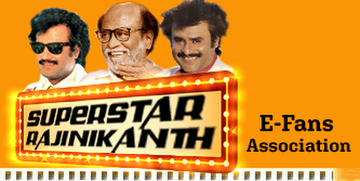 At that time, an interesting episode took place between Kalaignar and Superstar. 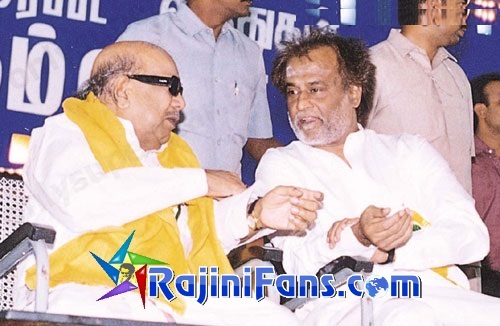 On seeing Rajinikanth standing, Kalaignar affectionately said 'You sit down. Why are you standing?' for which Rajinikanth replied 'I will not sit while you are standing.' - Do you know what this demonstrates? This demonstrates 'I will stand as long as he stands', that Rajinikanth will stand till Kalaignar is standing. As per my knowledge, in this function alone many outsiders came to know how Aishwarya Rajini would look like. Even before this a few photographs of both the daughters were leaked - but they were not much prominent like this. 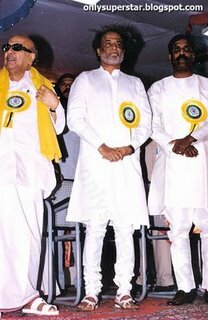 All those who spoke at the above function said that Kalaignar would win the forthcoming elections (2001) and retain the power. Each and every speaker including the awardees too predicted this in the stage and said, "Kalaignar would retain the throne in the coming elections surely and it is our wish too!!" 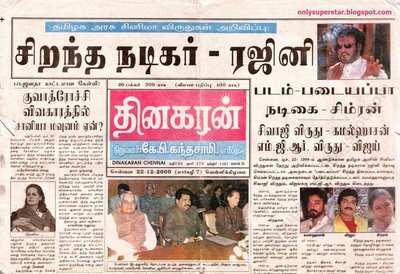 But Superstar didn't utter even a single word about it nor he predicted or wished Kalaignar that he would win the elections. He knows all. He carefully weaved the speech and also stressed that destiny is mightier. And as you knew, Jaya won the elections and became CM.